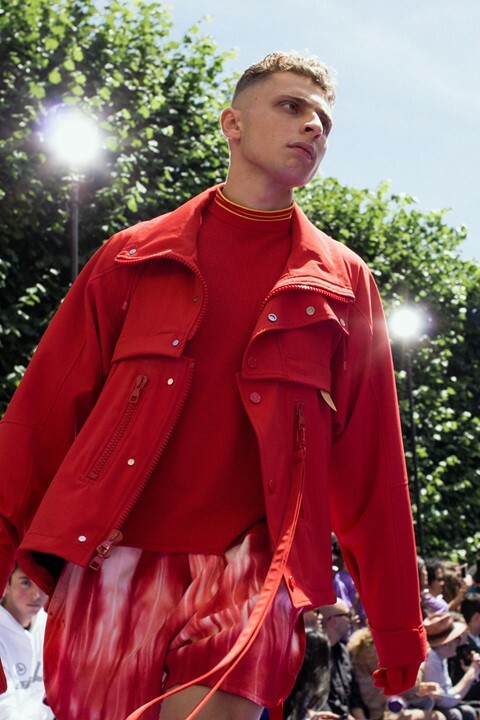 Following the announcement that Off-White founder Virgil Abloh would take over from Kim Jones at Louis Vuitton earlier this year, the fashion industry has been waiting with bated breath for this day. 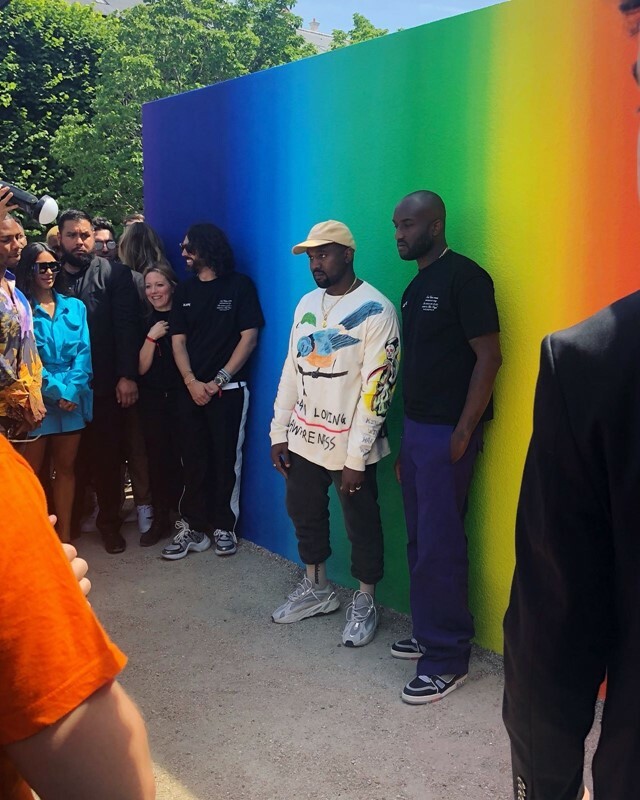 Marking the start of an exciting new era for the historic house, Abloh presented his debut collection at Paris’s Jardin de Palais Royal this afternoon – to onlookers including Kim K and Kanye, Rihanna, and Naomi Campbell. Here’s everything you need to know. ...who lined the super-long, single-row runway in t-shirts that corresponded with their position on the rainbow-gradient carpet. Coming from fashion schools including Parsons in Paris, each had a clear view from their position directly behind the frow. It was a gesture that was explicitly about empowering the next generation, and making them realise that they have a place in fashion too. The press notes left on chairs – along with rolled up LV t-shirts in tubes – started with a map of the world, marked with a series of dots on various destinations. Each one demonstrated where the models appearing in the show and their parents were born. As Abloh posted on his IG earlier today, it was essential to his concept to show “a global view on diversity linked to the travel DNA of the brand.” Louis Vuitton is a luxury house built on travel, and this felt like a genuine embodiment of our global society. As LV’s new men’s artistic director, with the eyes of the world on him, the designer set out to establish his position within – and vision for – the brand from the very off, including “The vocabulary according to Virgil Abloh” within his press notes. This was essentially a cheat sheet as to his outlook, with ‘collaboration’, ‘afterparty’, ‘Kanye’, and ‘disc-jockey’ among the words explained. The first explanation covered ‘3% – the exact ratio needed to twist a normative object into something special’, something Abloh has been doing since way back in his Pyrex Vision days. Including London skater and artist Blondey McCoy, Playboi Carti, Steve Lacy, Kid Cudi, and A$AP Nast. Kanye – who sat front row, next to Kim – cheered on his friend from the sidelines and embraced the designer in an emotional hug as he came out to take his bow. Aside from the star-studded cast, the show’s line-up was notable in the fact that it was predominantly made up of models of colour – a statement Abloh wanted to make to express the diversity of youth today. ...from a bandstand halfway down the catwalk. The contemporary jazz group have collaborated with the likes of Wu Tang’s Ghostface Killah, Tyler, The Creator, Kaytranada, and Earl Sweatshirt, and they’re also playing the LV afterparty tonight. Also playing out across the sound system was “I Thought About Killing You”, taken from Kanye’s recent album Ye. Over the course of the last few days, the designer posted a series of sneak-peeks at the collection on Instagram, and today we finally got to see them IRL. As well as understated, futuristic white sneakers and formal shoes with day-glo laces, and utility-style harnesses with pockets throughout, there was a reimagination of the classic LV monogram, which Abloh turned into transparent travel bags and holdalls with chunky perspex chain handles. ... and featured louche, tailored suits with wide-trousers and double-breasted jackets, shearling aviator coats, sportswear-influenced silhouettes, and utilitarian shirts and combat-style pants, many of which were overlaid with structural backpacks and pouches. Detailing was to a minimum – the looks were very fresh, and very clean. As the show went on, models wearing more colourful styles began making their way down the runway. Sweaters with tie-dyed detailing, floral bomber jackets and shorts, and pieces bearing motifs inspired by (or lifted directly from) The Wizard of Oz all featured. Abloh has followed the yellow brick road – or in this case, the rainbow one – all the way to LV HQ, and taken his seat on its golden, monogrammed throne.